We have been receiving a lot of calls in our Service Centers and on our Compute This Radio Show about the newest version of MBAM and the annoying Malwarebytes Premium Trial Expired popups it generates. Malwarebytes is a useful tool for finding and removing malware when you are using cut-rate or free antivirus software. For years we have recommended that our customers have MBAM installed on their computers to scan on demand. Version 3.0 and higher of Malwarebytes acts less like a run-on-demand application and more like a super annoying antivirus wannabe program. Once installed on your computer it will generate a popup up to three times a day asking you to buy an upgrade to the premium version for real time monitoring. Having more than one program monitoring your security in real-time will slow down your computer and can actually DECREASE your security. It is not a good idea to run the Malwarebytes Premium program along with another antivirus product. I have Symantec Endpoint installed on my computer, so I have no need for MBAM Premium. With that said, I still value Malwarebytes as a second opinion to scan my PC on demand when I want to run it. 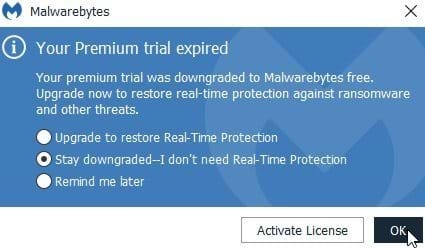 Here are the step-by-step instructions on how to prevent Malwarebytes from starting up with your computer and displaying those annoying upgrade popups. Undoubtedly as people take to disabling the entire tray application, MBAM will automatically re-enable it each time an update is installed. Favorite this page so you can visit again if the popups return. If this article was helpful to you, please review us on Google or Facebook!